Do you know that time between grocery trips when your vegetable crisper, fridge, and pantry are at their leanest? I know that time all too well. Despite my love for cooking, and my aspirations at domesticity (what with homemade stock, cookie dough in the freezer, and all that jazz), I am nowhere near the experienced homemaker. I haven’t yet perfected the art of regularly scheduled grocery trips and sometimes let the ideal time for such trips slip past me. This leaves me with little choices for mealtimes, my poor daughter out of eggs (one of her favorite breakfasts), and my husband woefully eking out what it left in the toothpaste tube. In any case, I make no claims at being an accomplished house-keeper. Between work and life and toddler swim classes, things like the grocery sometimes fall by the wayside (unlike the market, which I seem to be devoted to…hmmm). If you find yourself in similar straits (high five fellow human!) this dish is for you. Almost everything here is made from pantry staples. The fish fillets I had in my freezer. They were already-portioned pieces of a new brand I had been wanting to try. I know I extoll buying fresh seafood, especially as we live in a magnificent tropical archipelago, but I also like keeping a pack of frozen fillets for just such emergencies as this. Olives, capers, and anchovies are regulars in my pantry and I can almost always count on finding a bottle or tin of one or the other rattling around. I can’t recommend them enough. They are easy to have on hand and are instant flavor boosters. And I can usually count of having a few tomatoes or a lone lemon straggling about somewhere. – Pat the fish fillets dry and place them in a baking tray. I like to line mine with parchment but you certainly don’t have to. Drizzle the fillets with olive oil. Zest about half of the lemon over the fish. Cut the lemon in half and spritz the fillets with half the lemon juice. Sprinkle with just a touch of salt (your topping will be salty enough) and a good cracking of black pepper. Place in a pre-heated 400F oven and baked for 12-15 minutes or until fillets as just cooked. You know they are cooked when the meat flakes easily when poked with a small knife. – While the fish is baking, heat a skillet over medium high heat. When the pan is hot add a couple of generous swirls of olive oil. Add the onion and garlic, and sauté until the onion is soft and translucent. Add the tomatoes and toss. Sauté until the tomatoes just start to soften but still maintain their shape. Add the anchovies and mix through, crushing them as you do. Add the capers and olives and toss. Cook for about a minute more then take off the heat. Add a drizzle of olive oil, some cracked black pepper, and toss one last time. Set aside. – When the fish is done top each portion with the tomato mixture and serve. Just some notes: When I say the capers and olives are very roughly chopped, I do mean roughly chopped. No need to bother about same-sized pieces or uniformity of any kind. For the capers I just place the pile under my knife and, quite literally, in two chops the work is done. You don’t want little caper pieces; you just want to open them up a bit. For the olives I use a little bit more than two chops but still, they remain messily uneven, some pieces bigger then others. That is exactly the way it should be. Everything about this topping, sauté, chunky sauce (call it what you will) is rough and unapologetic. If you lucky enough to have some roasted red peppers lounging in your fridge somewhere, or perhaps the last of your fresh herbs, please feel free to add them in too. You can use any white-fleshed fish fillet here, or, actually, any fish fillets at all. I used Atlantic cod, but cobbler, dory, tilapia, or halibut would do just as nicely. 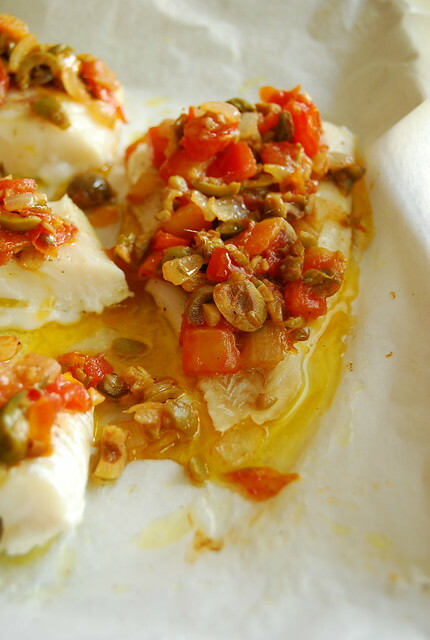 In fact, you could even bake a whole fish on the bone and top with this tomato-olive-caper sauté and I think it would work excellently as well. This topping is as flexible as it is tasty. Use it for steamed chicken, atop a bunch of sautéed shrimp, or to stuff a baked potato. I would even pile it on a thick slice of artisan bread, top with a fried egg, and call it brunch. What do you like to throw together when the cupboard is almost bare? A perfect combination! This healthy dish looks droolworthy. i sometimes use tomatoes, ginger, onion,freshly cracked pepper and salt and bake. onions, garlic, cans of lentils or beans and crushed tomatoes, bouillon cube and presto…lentil soup! I really enjoy being able to.cook out of ingredients left in the fridge on Thu or Fri. best and easiest for me is left over rice to make Chinese fried rice, kimchi rice, etc. Definitely something for dinner on a dreadfully hot evening. Yummy! I'm going to try this one of these days! I love reading your entries! Hi Anonymous person! That sounds delicious! Hi Corrine! Fried rice is my favorite go-to dish for leftovers! Hi Midge! Omg, that cookie idea is brilliant! Hi OompaWoompaGirl! Glad you enjoy the blog and hope you enjoy this dish!! oh lovely! its really hard keeping fresh produce in thee house specially when you don't have a regular routine/ schedule at home. Can't do without frozen food. Hi Global Chow! That sounds delicious! This sounds delicious. However, I wish you would provide a print option just for the recipe and not all the other comments.